I don’t know about you, but some weeks are more expensive than others, and if you’re waiting on payday, a big bowl of rice and pinto beans will sustain you until the money hits the bank. Other than being filling and quite inexpensive, beans are really, really good for you! What Type of Beans Should I Use? This recipe can be used with red kidney or pinto beans because the two beans have basically the same nutritional and flavor profiles. Kidney beans are a little larger than pinto beans and often a darker color. Sometimes, it’s the simple things in life that we take for granted– milk and cereal, peas and carrots, eggs and bacon, and rice and beans. Interestingly, rice and beans have been staple menu items in many cuisines for centuries, but is this by chance or by design? Did our ancestors realize the composition of these foods actually results in a complete protein? Both rice and pinto beans are supplemental, or incomplete proteins. Each is abundant and deficient in an essential amino acid. However, when combined, the nutrient profiles of these foods work synergistically in producing a complete protein. There’s nothing more satisfying than a big bowl of scrumptious pasta with fresh Mozzarella, Parmesan and San Marzano Sauce! A pound of Rigatoni fills a 9 x 13 pan, which makes this a perfect choice for large groups and…it’s very cost efficient! 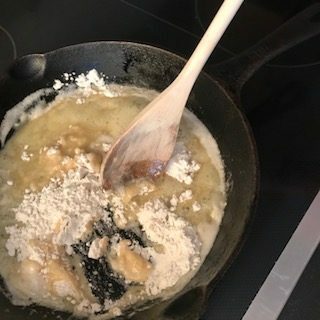 Can I Use A Different Pasta Than Rigatoni? Yes! Any tubular pasta works well with this recipe! Consider using Penne, Ziti or Bucatini as a substitute. The point is, tubular pasta holds the sauce better than long strand pasta. Can I Make Baked Rigatoni in Advance? Absolutely! 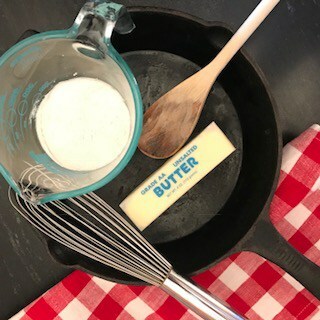 There are two ways you can make this recipe in advance: 1) cook the pasta and assemble the dish with cold sauce and cheese; cover and refrigerate (up to 3 days) or 2) prepare, bake and assemble the entire dish, then refrigerate it for up to 3 days. Note: if you freeze this dish, you may need to add a little water prior to re-heating because the tomato sauce will thicken when frozen. What Should I Serve with Baked Rigatoni? 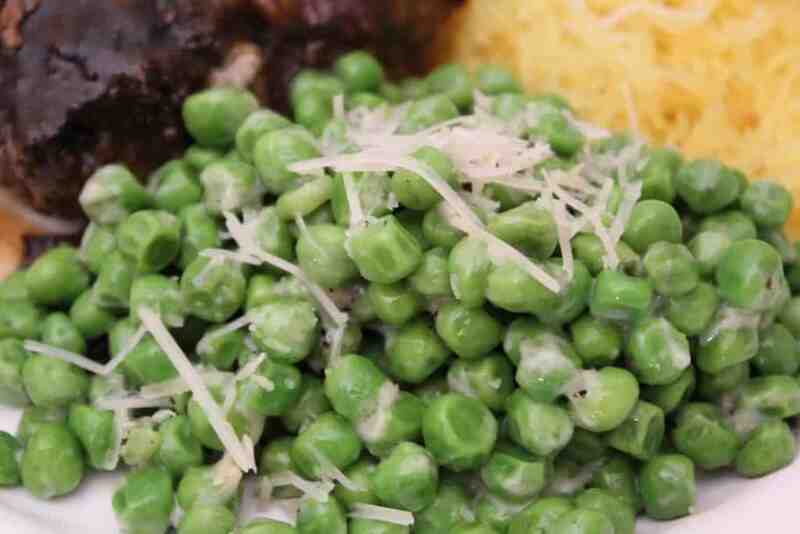 A fresh green salad is always nice; or you might want to serve a steamed artichoke. Another option might include a side of ratatouille or eggplant fritters. Simple, easy and delicious-tubes of pasta nestled in a heavenly tomato sauce with Mozzarella and Parmesan cheese. 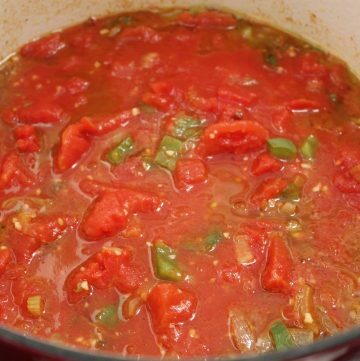 This recipe can be made with either homemade San Marzano sauce or jarred, pre-made sauce. …but I was out of rice, so I used pasta. 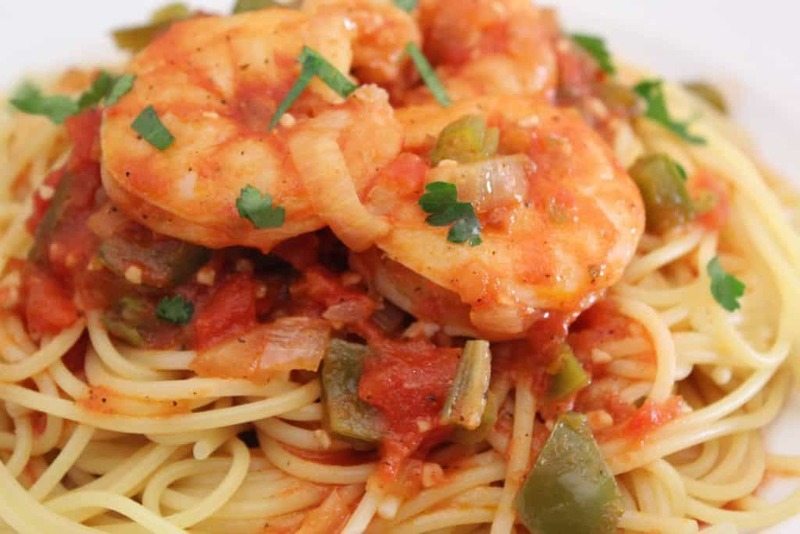 You can use rice or pasta as the base; it doesn’t really matter because the Creole sauce is what this recipe is all about! 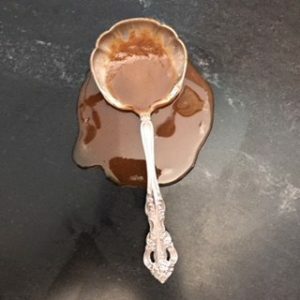 The Holy Trinity is key to Creole or Cajun cooking; both versions use similar spices and seasonings, but Creole is generally more spicy than Cajun. The Holy Trinity is the Cajun and Creole version of the French mirepoix. 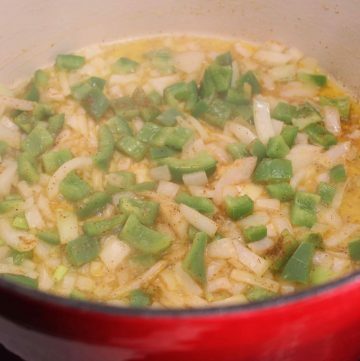 Mirepoix is a flavor-base derived from sauteed onions, celery and carrots. 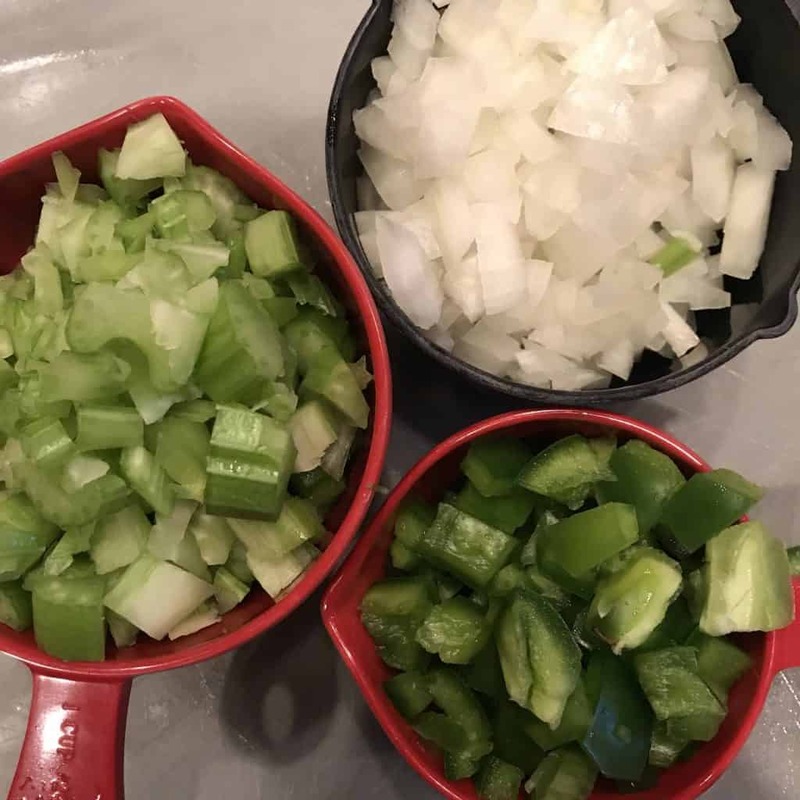 The Holy Trinity substitutes green bell pepper for carrots in the same ratio as mirepoix with 2 parts onion to 1 part each celery and green bell pepper. What’s the Difference Between Creole and Cajun Food? As with any population, culinary characteristics are intrinsic to the culture and the people. The term “Creole” refers to those American-born Spanish, French, Portuguese, Irish, and West African people who are descendants of the original French colonists who settled in New Orleans during the 1700’s. Creole’s were a mixed population of race, creed and color. Cajun refers to the population of French colonists who came to Louisiana via the Acadia region of Canada. They called themselves Acadians , or “Cadians”, which eventually became “Cajuns.” The Acadians (or Cajuns) were forced from Acadia by the British and dispersed throughout the country, with many eventually settling in the swampy region of Louisiana that is known today as Acadiana. The Creole population was a bit more sophisticated and wealthy than the Cajuns. Creole’s were city dwellers with access to some of the finer things in life, including food. Acadians, or Cajuns, were a more simple population, often living off the land through farming. 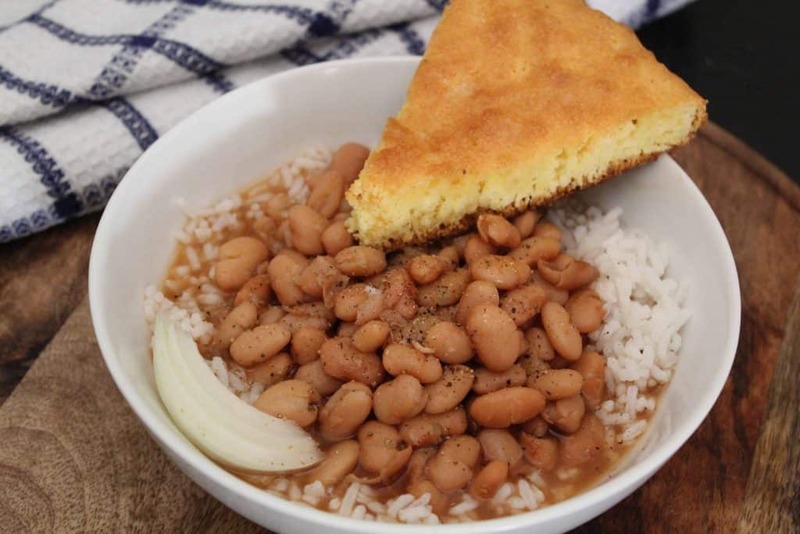 In Louisiana, Creole and Cajun cooking have distinct characteristics. Creole recipes incorporate tomatoes, due to the Spanish influence, whereas Cajun foods have more French influence, often using a roux as a base for recipes. 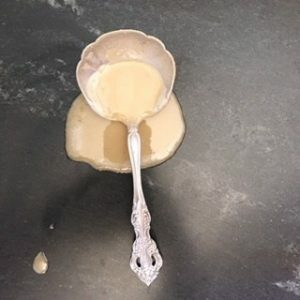 The Holy Trinity is key to Creole or Cajun cooking; both versions use similar spices and seasonings, but Creole is generally more spicy than Cajun. In the State of Louisiana, you’ll find both Creole and Cajun dishes throughout. New Orleans hosts a number of high and low-end restaurants featuring both fabulous cuisines. 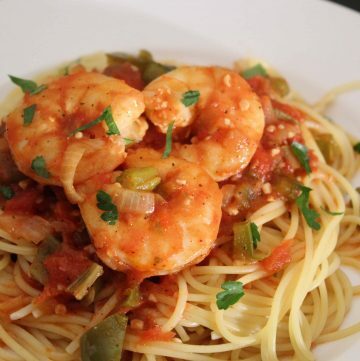 What Type of Canned Tomatoes Should I Use in Creole Shrimp Pasta? Stewed tomatoes work really well in this recipe! Consider using stewed tomatoes that have onion, celery and bell peppers already included; this doesn’t mean you can exclude the Holy Trinity, it just adds a bit more flavor to the dish! If you do not have a shrimp deveining tool, use a sharp paring knife. Simply score a small cut along the top of the peeled shrimp; you may see a brown or gray membrane…remove the membrane and rinse the shrimp. 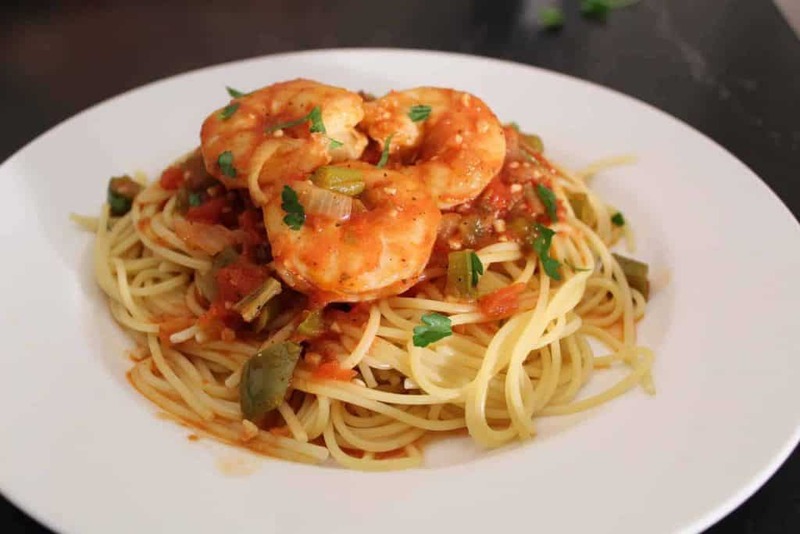 Can I Make Creole Shrimp Pasta in Advance? 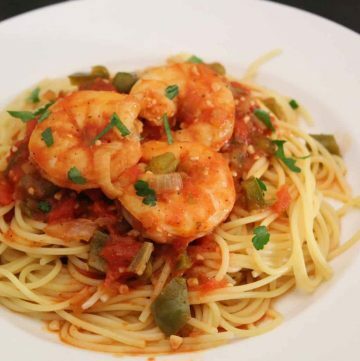 If you’re short on time, make the Creole sauce in advance and refrigerate it until you’re ready to serve the dish. 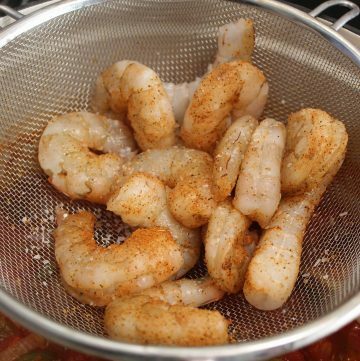 When ready to serve, prep and season the shrimp, heat the Creole sauce on medium-high heat. (Due to the thickening of the Creole sauce when refrigerated, you may need to add a bit of water when re-heating the sauce.) Bring the sauce to medium-high heat, add seasoned shrimp, reduce heat, cover and allow to simmer while you prepare the pasta. If you’ve ever made a cake or a batch of cookies than were an epic fail, it might have been due to the age of the eggs used in the recipe. There are few tell-tell signs to determine the freshness of the eggs in your fridge! 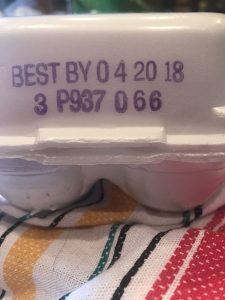 On the end of each egg carton are three-digit numbers called the Julian date. These numbers range from 001-365, representing the days of the year with January 1 being 001 and December 31 being 365. Additionally, these numbers represent the day the eggs were packed. For eggs packed on March 28th, the Julian date would be 087. (Additional numbers on the egg carton represent the egg manufacturers plant identification.) When purchasing eggs, check the Julian date and select a carton that has eggs at least five days old. 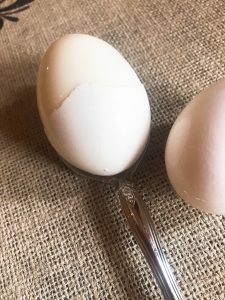 Very fresh eggs (under five days old) are more difficult to peel when boiled because the shell membrane is still very intact with the shell. Another way to determine freshness is to place the egg in water. Fresh eggs will sink and stand more upright because their air sac is small. Old eggs will float. The floating is due to the increased air sac that forms internally at the top of the egg once it is laid. Once an egg is laid, there is no air sac. However, the air sac begins to develop as the egg ages and a gap develops between the shell and the egg membranes. The air sac is formed and enlarges as the egg ages due to the loss of carbon dioxide and moisture. A fresh egg, when cracked, will produce a yolk that is centered and stands up in a rounded form and has a large proportion of thick white around the yolk. If the egg spreads out on a plate with an off-center yolk, and a lot of clear, thin yolk with little thick, white yolk it is old. Grade AA? A? Jumbo? Large? Regular? Without going into the complex world of egg candling, let’s just agree that Grades AA are near perfect eggs, ideal for making the perfect boiled egg. 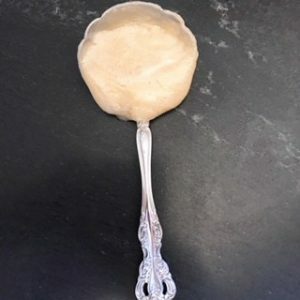 Grade A are good and Grade B are generally used for commercial uses such as egg powders, etc. When a recipe calls for an egg, it is usually based on large sized eggs. Let’s say you’re making deviled eggs and want a nice white, firm yolk with a tasty yellow seasoned mixture inside. 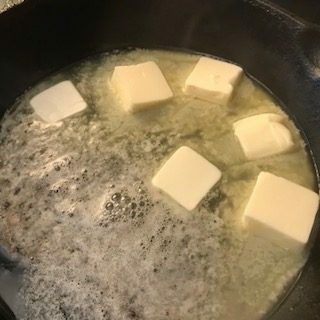 You won’t actually boil the eggs; just simmer them. 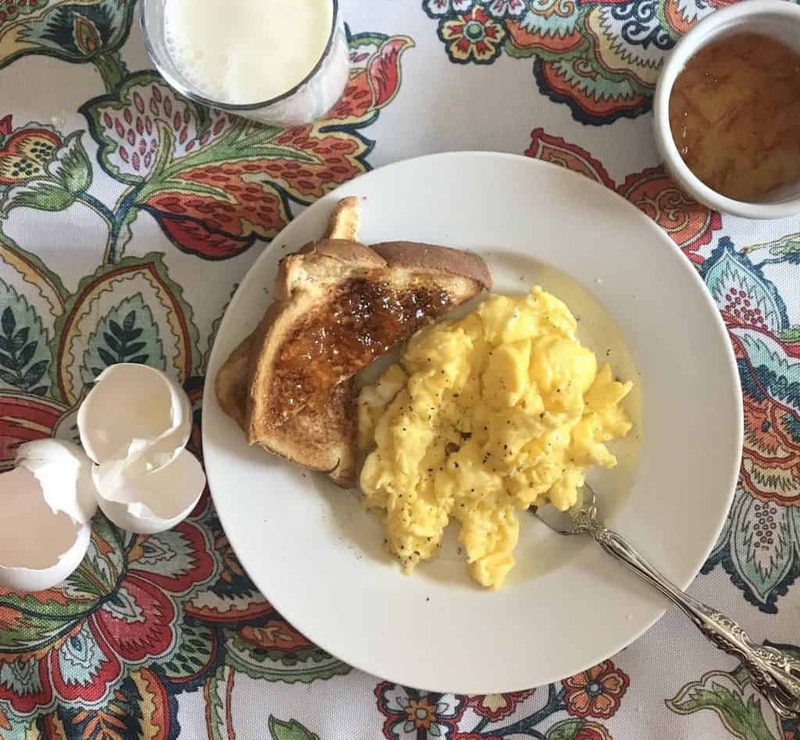 There are three basic methods for preparing boiled eggs, two versions of the Hot Start Methods and one version of the Cold Start Method. My experience indicates that eggs cooked in either of the hot start methods are easier to peel than those prepared the Cold Start method. Turn down heat to simmering (where a few bubbles form on the bottom and rise gently, but barely get to the surface) NOTE: this works great on a gas stove, but when using an electric stove, gently lift the pan above the burner, turn it to simmer temperature, wait a few seconds then return pan to stove. Same as Method 1 only once the eggs are submerged in the boiling water, place a lid on the pan, remove from heat, and allow to stand for 17-20 minutes. Place eggs in a pan with enough cold water to cover them by about one inch. 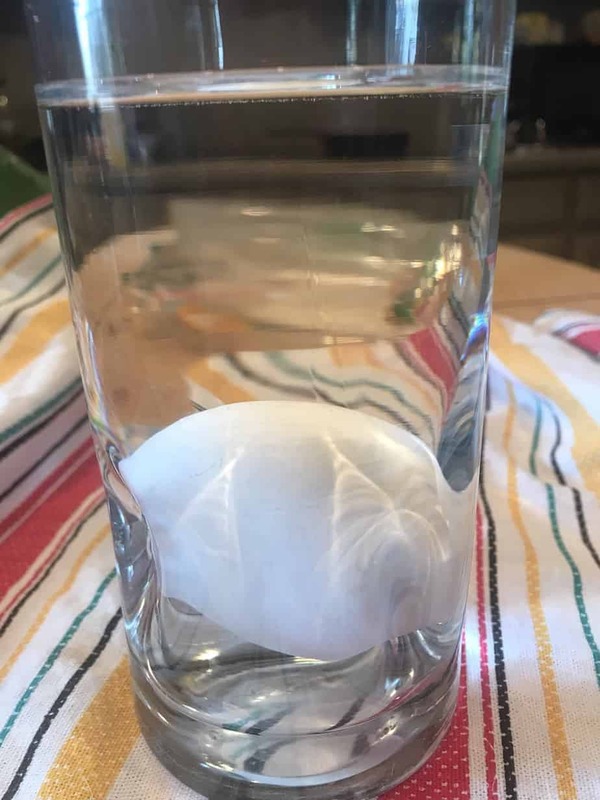 Regardless of the method used, the most important thing to do to produce the perfect boiled egg is to immediately submerge them in icy cold water. 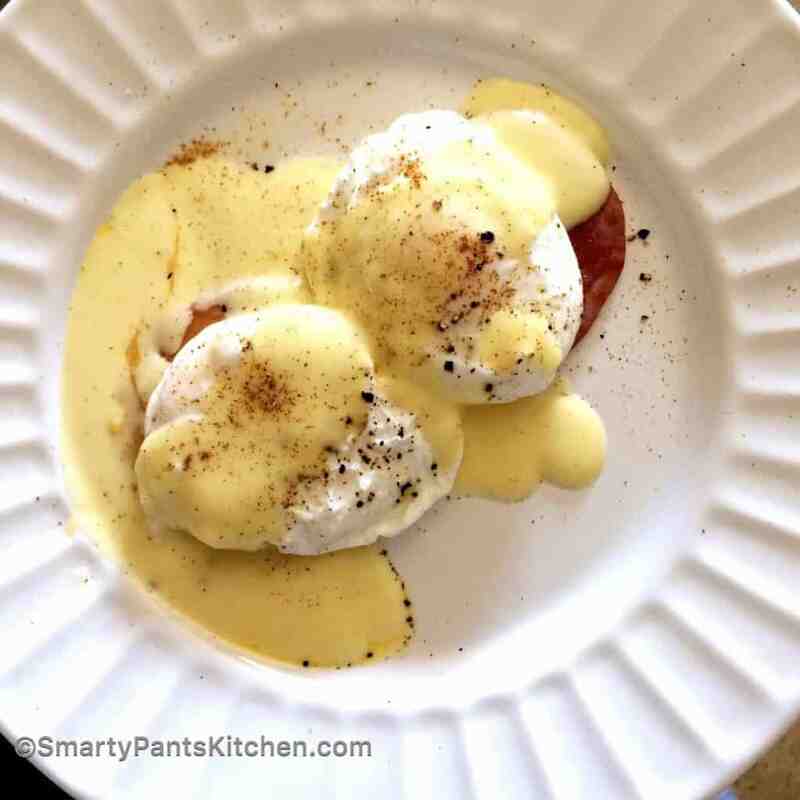 This stops the cooking process and prevents the ugly greenish-gray ring around the yolk. The green ring is caused by the reaction of hydrogen sulfide (from the egg white) with the iron from the yolk. A green ring will occur more often in older eggs. Perfectly boiled eggs are easier to peel under running water. Just put a colander in the sink and peel, making sure the shells do not get into the disposal. 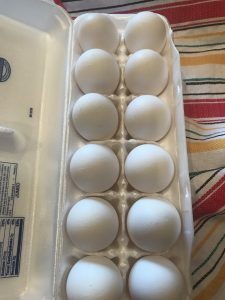 Store eggs in their original carton on a shelf and not in the egg bin on the door! Eggs stored in the egg bin allows air to flow around the eggs and facilitates the loss of carbon dioxide and moisture, making the eggs age faster. Eggs should be stored in cartons at 40° F or below and never rinsed. Rinsing permeates the protective shell, allowing gases to escape, thus the egg ages faster. An egg at room temperature will age more in one day than in one week in the refrigerator. Generally, eggs that are 3-5 weeks old are safe to use in foods. 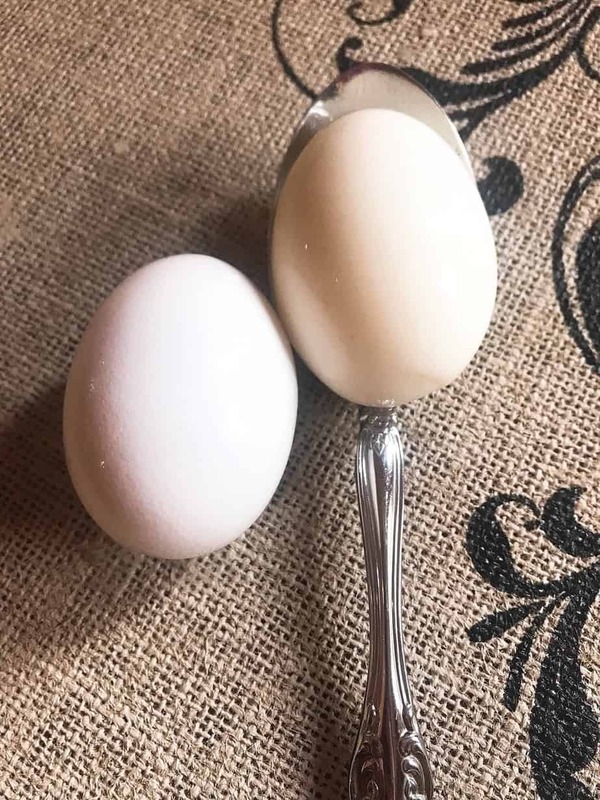 The color of the egg shell is determined by the breed of the hen. Hen’s with white feathers produce white eggs; hens with red feathers produce brown eggs. It is not possible to determine the vitamin content of vitamin A in an egg based on color because the pigments in the shell are not precursors for vitamin A. The color of the yolk is based upon what is fed to the hens. The albumen, or white of an egg, accounts for about 58% of the eggs total weight and offers 11% protein. The yolk accounts for about 30% of the eggs total weight, contains 33% of the egg’s fat, 17% of the protein and 48% of the water in an egg.